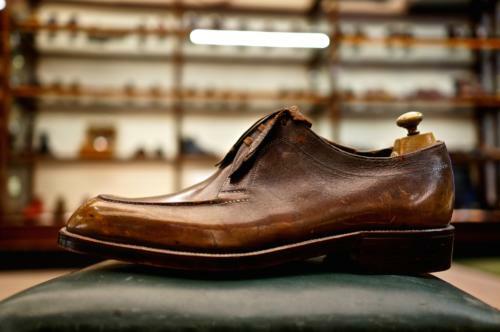 Foster & Son is one of the great names of British bespoke shoemaking. In recent years, that reputation was largely founded on master lastmaker Terry Moore. I only got to know Foster’s relatively recently, after Terry retired. Changes of ownership and direction got in the way, and it was only when Andy Murphy joined to company from Cleverley’s that I got in and met the team Terry put together before he left. I’ll cover the team and their work over a series of upcoming posts. For the moment, I thought it was interesting to show the Foster’s archive of bespoke shoes. 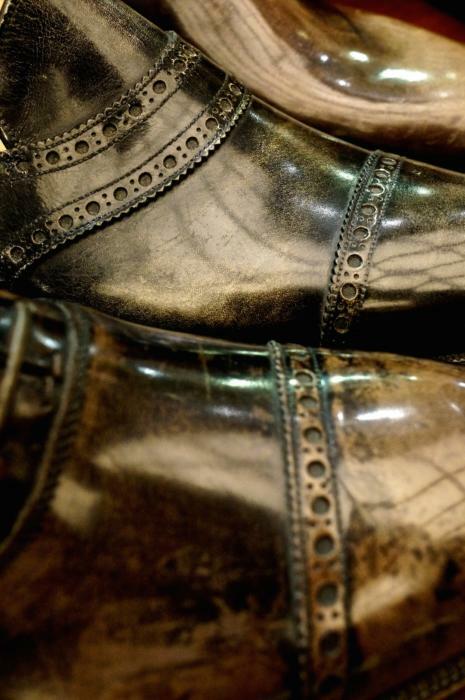 Anyone that has been up to the bespoke workrooms above the shop at 83 Jermyn Street will have seen the shoes arrayed on shelves up the stairs. These are all bespoke samples. 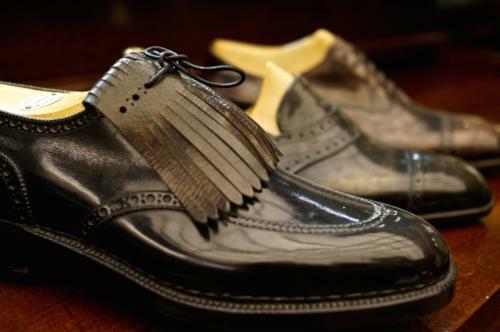 Historically, every time Foster’s made a significantly new bespoke design, they made a single sample shoe to retain it. Some other bespoke shoemakers did the same thing, but made a pair. 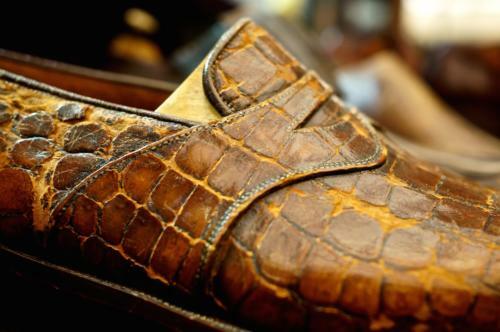 Problem was, over time those pairs got sold – someone was always short enough on cash to want to sell them off. Foster’s is fortunate to have a great archive of styles, therefore, some of which I have pictured here. There’s nothing entirely new about any of them, but it’s interesting to see an English shoemaker offering some fairly daring designs. It’s also interesting how some of those have aged. Foster’s became known for the ‘Foster’s fade’ on its shoes that came from pairs being in the window for years at a time. The sunlight faded areas such as the toe cap and heel, creating a rather pleasing bleached effect – you can see it to particularly good effect in the top photo. Andy and the others at Foster’s have been working on a range of ready-made shoes that incorporate some of these designs and approximate the fading effect, which I believe will be available later this year. It will be interesting to see how they get on. For those interested in Foster’s ready-made shoes, they do three different lines: Classics (from £365), which include the loafer models they are particularly known for; Maxwell (same price) for heavier, country shoes that use a similar last to the old, bootmaking brand Maxwell; and Heritage (£475), which are the top end and are all hand-lasted etc. All made in Northampton by various factories. 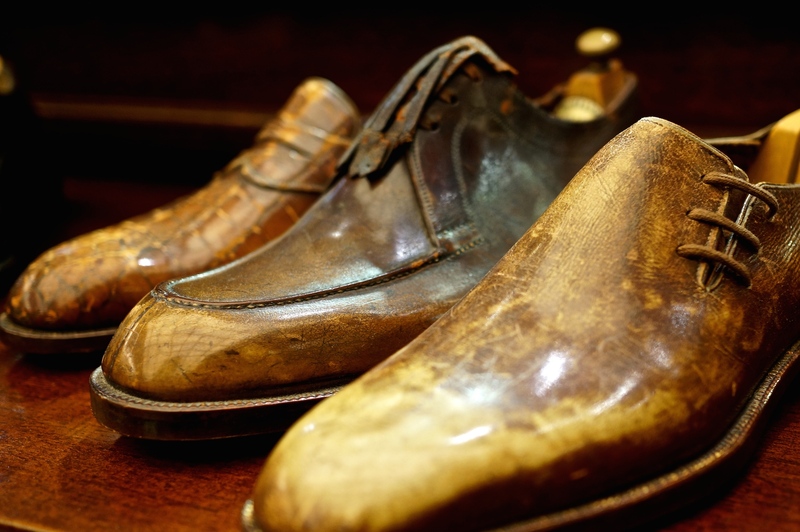 You can follow the discussion on Foster & Son bespoke shoe samples by entering your email address in the box below. You will then receive an email every time a new comment is added. These will also contain a link to a page where you can stop the alerts, and remove all of your related data from the site. Interesting (as always) post, great photos! Thank you Simon! Foster & Son always catches my eye when I’m on Jermyn Street. I’ve never researched the brand much, but something about them sets them apart—that high-gloss shine and antique fade combination is gorgeous. The shoes in the window always look curiously aged. Interesting to learn why that is. I agree with you, Patrick. There is indeed something special with F&S’s shoes. Shoes with with character, that is. Sorry to be off topic here – although I did wear my pair of Foster & Son RTW yesterday – but I have a question about bespoke ties. I’ve recently contacted Gianni at Passaggio Cravatte and I am taken by his vintage cashmere fabrics. Most days I wear a RLPL Keaton-shirt extra spread collar so I need a little bit of a bigger tie – if I wanted a thicker tie knot, do I need to have a tie with more/thicker material? There are lots of ways to get a thicker knot, the best being thicker material or thicker lining, while alternative tie knots or double loops are worth avoiding. If you’re getting a bespoke tie from Gianni, I’m sure he could put a thicker lining in for you, or if it’s cashmere you should be ok with a regular lining. Simon, I was looking at some of your old posts, on a bespoke jacket curves in an arc down the back (unlike most RTW which falls straight). Does a closely cut back restrict movement at all? Appreciate your response, perhaps this is to do with me putting weight on, the part of the back behind the armhole is particularly susceptible to putting on flab, which means stretching the arms forward pulls the lower back of my coats. Is building in more room as you say in the back to allow for movement possible post facto on a bespoke coat? Would it ruin the aesthetics of the jackets? Thank you for featuring this company. I visited their Jermyn St. shop a while ago and greatly admired their shoes. So excellent was the finish and colour on some of the models that they really were works of art. Really beautiful pieces. It is also worth noting the excellent leather work on their cases and bags…should you write a piece on English leather luggage they might be worth a mention (English manufacturer HJ Cave invented the modern case and the handbag). For some reason I recall that C&J manufacture their RTW line – is this still the case?